Our institution has a well developed and well furnished library with 10000 books in varied subjects. 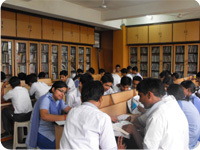 It has reading room with a capacity of 50 students at a time. Books are ranging from magazines, periodicals & laurels to biographies, fiction, reference books, dictionaries, encyclopedias & books on scientific research, short stories, drama poetry & other topics. It is open for 8 hrs. for the use of teachers and students. It is in the process of continuous upgradation.Information on careers, competitions & examinations is constantly updated.